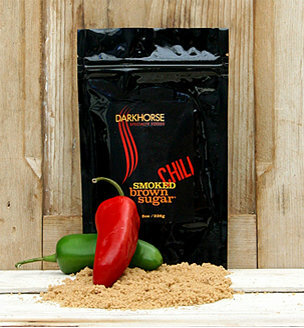 Our CHILI SMOKED BROWN SUGAR is the perfect balance of sugar & spice. It adds an intriguing smoky-spicy-sweetness to sauces and stews......and yes, it makes the best chili you’ve ever had!! Using only the finest brown sugar and our custom wood blend; we slowly, gently smoke the sugar for an irresistible flavor that is the perfect addition for sweet and savory creations. Some favorite uses include; baby back ribs, salmon, grilled chicken, acorn squash, baked beans, sweet potatoes, crème brulee, popcorn, grilled pineapple, peanut butter cookies, streusel topping, and it makes a show stopping compound butter for cornbread, meats and vegetables. Sold in a resealable pouch of Smoked Brown Sugar. INGREDIENTS: Naturally wood smoked sugar, invert sugar, cane molasses, and chili powder.